All Due Respect Issue 7 has arrived and if that doesn’t quicken your pulse you may be dead. 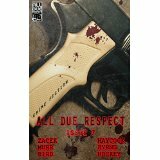 The release of the All Due Respect quarterly publication is one of the greatest events that happen in the noir realm. Every issue has been jam packed with great noir stories, great interviews, and awesome book reviews and this issue continues that trend. The issue opens with the story Wet City by Ray Zacek and it is a great slice of noir with 2 men looking to take what belongs to a local drug dealer. They believe this will be an easy robbery, but as in any great noir story, things aren’t always as they appear. This story sets the bar pretty high for the stories that follow, but as a reader of all the ADR quarterly issues, I knew the other stories could, and would, hold their own. Shoot the Dog by Joe L. Murr demonstrates the most deadly thing in a noir story just might be a woman who is out to make sure she gets what she wants. This story leaves you wondering why any man would trust any woman. Great story with an awesome ending that leaves you racing onto the next story like a fiend who needs their next hit. Well that next hit satisfies even the most hardened noir lover! Histories of the Dead by Math Bird is like noir crack for the reader. I loved this story and really enjoyed the notion that sometimes revenge may take a long time to come around, but it always comes around. Great tale that proves revenge is best served cold…as long as it is served in spades. Dead Dogs and Boomsticks by Matthew J. Hockey mixes family loyalty with drugs and murder. I loved the manner in which Hockey uses his words to paint a picture of absolute revolution. “Yellow hooded sweatshirt open over his distended stomach, tar black blood pooled solid in the lines of where his gym-sculpted abs would have been if they hadn’t dissolved away”. Beautiful imagery…absolutely beautiful. Next up is Night Driver by Brian Haycock. This shows the life you subscribe to if you choose to be a call girl or a pimp. A quick, but hard hitting story that shows an economy of words is not a detriment to a great story. Six-Inch Valley by Frank Byrns is a love story with a noir twist. This shows that even criminals long for love…but we all know it is out of reach. I found this story to be a great one and closed the short story section with a bang. This issue contains interviews with the publisher of 280 Steps Publishing (check out some of my older reviews for an idea of the great books they are publishing) and Patricia Abbott. I have not read Abbott’s Concrete Angel and this interview put it right at the top of my TBR pile. Add all this goodness to 6 book reviews and a preview of the ADR book, Nine Toes in the Grave by Eric Beetner and you have an issue that is begging to be bought and enjoyed in a sitting.